BSNL offers CDMA Prepaid Mobile Plan - JOY for South Zone (Andrapradesh, Karnataka, Kerala, Tamilnadu) Customers with Lowest Call Charges. 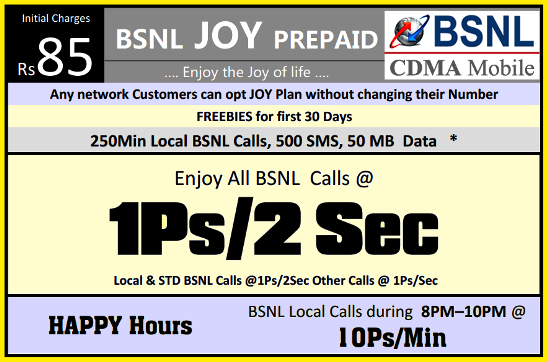 BSNL CDMA Mobile JOY Plan offers all Local / STD BSNL calls at 1ps/2sec and Other network calls at 1ps/sec with out recharging any Special Tariff Vouchers. BSNL JOY Plan also offers Lowest data usage charges in Peak / Off Peak Hours and applicability of HAPPY Hours. Customers can enjoy the cheapest call charges of 10ps/Min for all Local Calls in BSNL Network during Happy Hours (from 8 PM to 10 PM). Removable User Identity Module (RUIM) is a card developed for CDMA handsets that extends the SIM card facilities to CDMA phones. BSNL offers Free RUIM SIM Cards for New / MNP JOY plan customers. The Start Up Kit (SUK) worth Rs 85 offers 250 Minutes Local BSNL Calls + 50 MB Data + 100 SMS (to Any Network) for the first 30 Days. The plan has got initial validity of 180 days also. HAPPY HOURS BSNL Local Calls during 8PM to10PM @ 10 ps./min. BSNL offers the lowest EVDO Data Tariff for Joy Plan customers. Both limited and Unlimited Usage Data STVs are available for Prepaid EVDO Customers. Dear readers, please share your views and opinions about this excellent offer from BSNL via comments with us.